After a total of fifty one hours of travel including four flights from Brisbane to Sydney, to Santiago to Guayaquil and a nine hour stopover in Guayaquil, we finally reached our destination; the spectacular Galapagos islands! 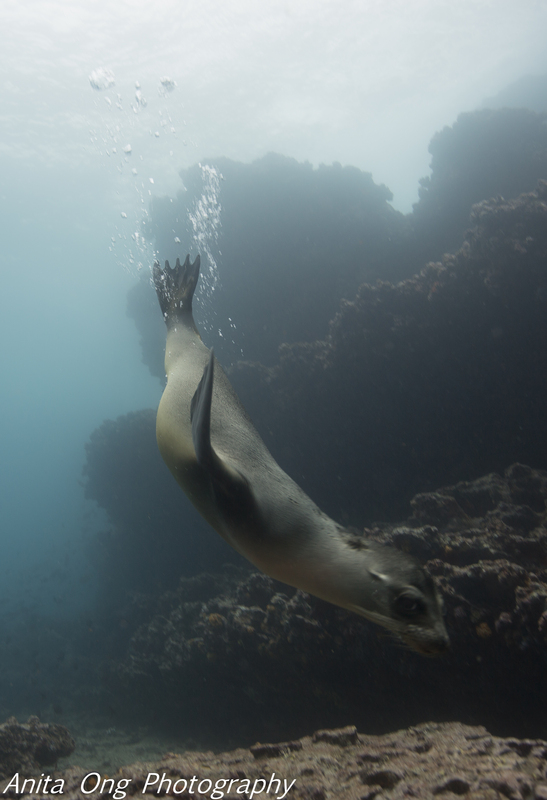 A place on most diver’s bucket list and a trip that spares no expense, we travelled with high expectations and got our hopes up watching David Attenborough’s documentary on the Galapagos beforehand in Australia. We spent some time exploring the islands doing day tours and some freelance tours on our own. We stayed in Puerto Ayora on Santa Cruz which was a cute seaside town and was easy to get around. Here we enjoyed some of the fresh seafood and in particular the ceviche which the town is famous for, caught by hand line by local fisherman, who are the only people with permits to fish the Galapagos waters, and it is the most sustainable way of fishing. 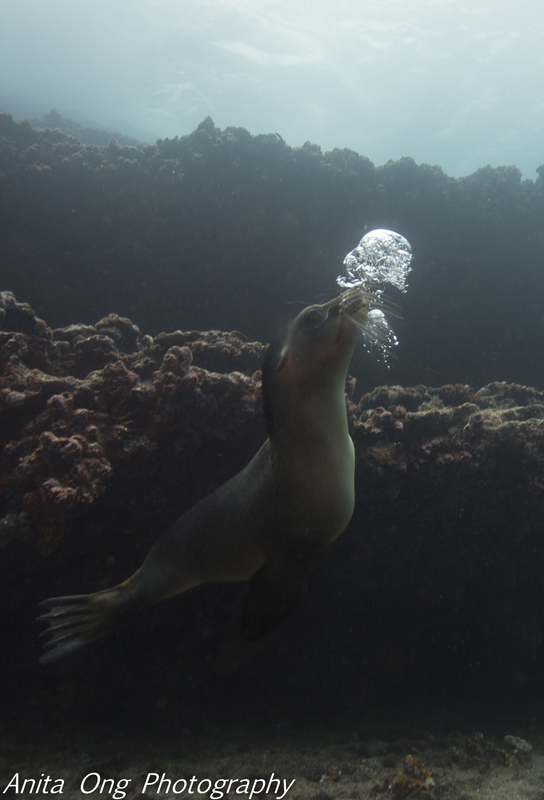 We explored Santa Fe and free dived with Sealions which was one of the most amazing things I’ve done. They are so friendly and curious, darting close towards you and showing off their incredible swimming and acrobatic abilities, making you feel completely inadequate and cumbersome in the water. Here we also saw the yellow land Iguanas which are rustic creatures and take you back to a prehistoric time. They bobbed their heads up and down to warn us away from their territory as they slowly walked over the dusty rocky terrain. 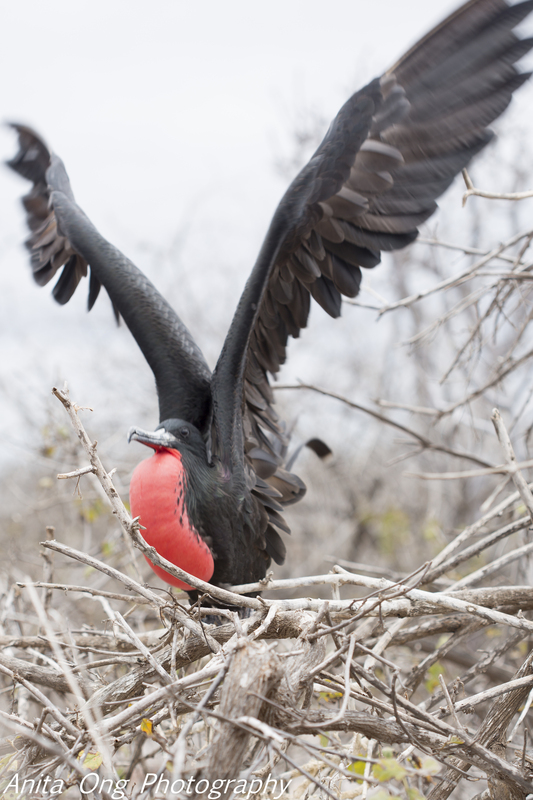 We visited North Seymour Island where we were lucky to experience the mating season of the large Frigate birds. 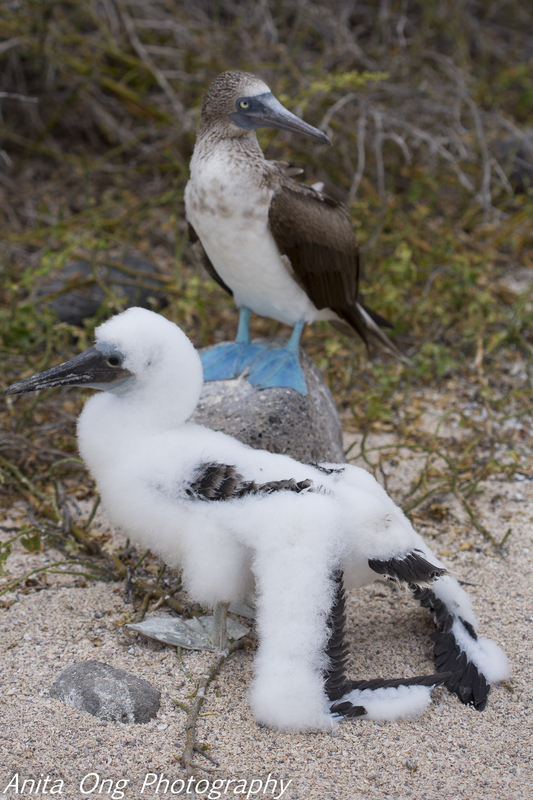 The males inflate their bright red chests to show off to the females and try to win themselves a partner. Here there were many nesting Blue Footed Boobies who were like something out of a cartoon; cute, funny and dorky, their mannerisms interesting to watch. In our poor Spanish we strung together enough words to get a local boat owner to take us to the nearby Bay. Tortuga in Spanish means Turtle. Here we tried snorkelling but the visibility was poor. Instead we opted to take a walk along the beach and photograph the hundreds of Marine Iguanas that lay in the sand soaking up as much energy from the sun as they could before their midday feast on the underwater seaweed. We saw them swimming in the water and also saw turtles and White tip Sharks here. 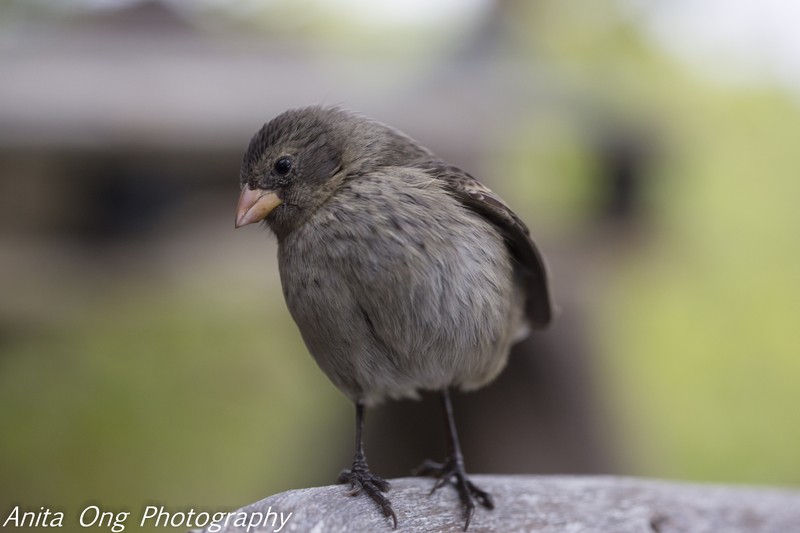 I’ve never really been much of a bird person but it’s hard not to fall in love with the Galapagos Finches. They are cute, round and fat, with their fluffy, tiny, perfect feathers and their little hops and bobs, they are a photographer’s dream. They are also responsible for giving Charles Darwin his main insight into the theory of evolution. Hauling nearly 200kg worth of diving gear and camera equipment between the four of us to the other side of the world, was all for the most anticipated part of the trip, the diving liveaboard on the Aggressor2. Our first day comprised of a check out dive to make sure we were weighted correctly and had the right equipment. 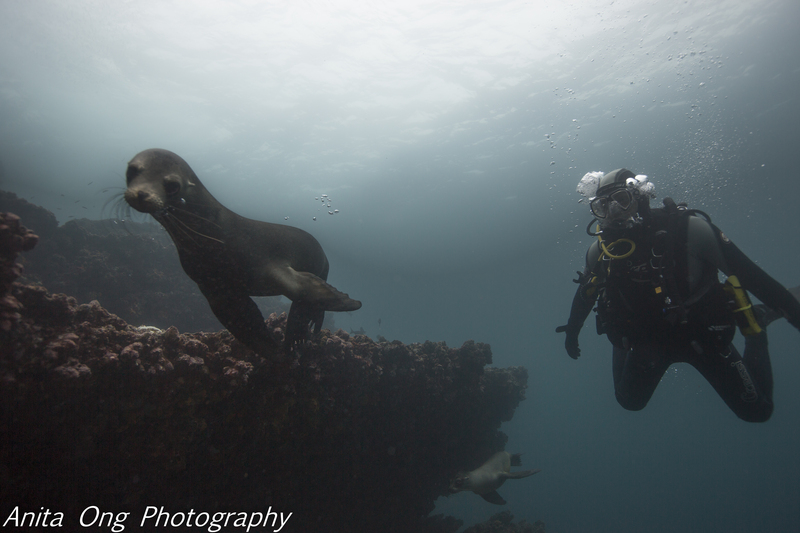 I was surprised to note some inexperienced divers on board with limited skills at the basics, when the Galapagos is known for being advanced diving and strong currents. On the second day we headed to Wolf Island to get the real diving underway and we could not wait! On our first dive the current was three to four knots in places and the idea was to descend down hold onto the rocks and watch the show go by. Doing that in Sidemount gear with a fairly large DSLR camera rig was something that I had to get used to, but it’s surprising what you can manage when you’re having the best dives of your life! Here I had undoubtedly the best dive I have ever had and it was my favourite dive site of the trip. We saw hundreds of schooling Hammerheads, who seemed somewhat unphased by us passing through them closely. We did safety stops with dozens of inquisitive Silky sharks and the beautiful large Galapagos sharks, we were circled by several large Eagle Rays on any given dive who appeared to be curious about us and check us out. We were showered by Tropical fish and hung out with many Giant Moray Eels amongst the rocks, one coming straight up to me which I caught on film, and was thankful I had the camera between him and I. We had many friendly Green turtles come and socialise with us, they loved twirling in our bubbles and many actually ran completely into divers or cameras. The largest Trumpet fish I have ever seen littered the rocky sea floor, big Kingfish and holy moly the biggest Tuna I have ever seen just cruising on by without a care in the world. Schools of hundreds of large pelagics like Jacks were always resident and there was an abundance of fish life wherever you looked. There is little coral there as most of it is rock so it is easy to perch down and get cosy on the rocks without damaging anything or you can attach a reef hook or grab the rocks and float in the fast currents which is pretty fun. 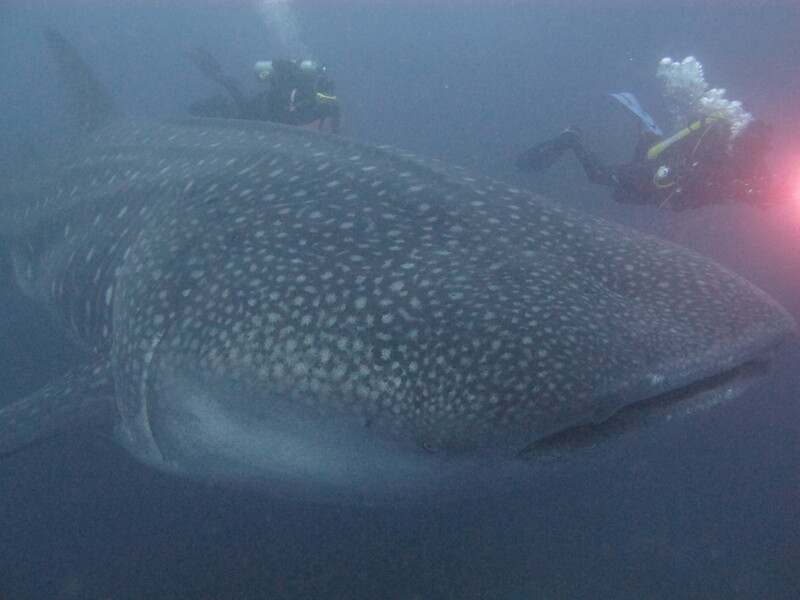 The next dive site was Darwin; known for seeing large pregnant Whale sharks during this time of year and after the dive guides said we had a ninety nine percent chance of seeing one, we were dying to get in the water! Some divers travelled from all parts of the world just to see the Whale sharks so the pressure was on for the dive guides. The first dive here there was a three to four knot current but on the other dives there was very little. On the first two dives no Whale Sharks! I was starting to think we may be the unlucky one percent that don’t get to see them and as there was no current on the other dives I started to doubt we would. But then I heard a continuous ringing sound and I knew a guide had spotted one. I was at the far end of the group so even though I finned my arse off to get over there I only just saw its large white spots in the distance. The rest of the group however who were closer than me had an amazing experience with the Whale shark and swam beside it for a few minutes, it even turned around and came back towards some of the divers. I was happy for the Americans who had never seen one before and who had especially picked this trip to see them. Everyone was on a high after the dive and you couldn’t wipe the huge smiles of their faces. That was a highlight for me seeing them so ecstatic. At Darwin the water was full of life, at times you wished the fish would get out of the way so you could film a clear shot of a Hammerhead Shark without disruption. We saw on a few occasions here the largest school of Jacks I’ve ever seen, both from below and also at one stage the school coming right into me. Being a part of a large school of fish is always an amazing thing, and we also saw a school of large Barracuda up close. On our last dive at Darwin I had kissed goodbye to my chances of getting close to the Whale shark, it was our last opportunity to see it again and as there was no current I just didn’t think it would happen. But I heard the continuous tank banging sound and I hoofed it over to find the biggest pregnant Whale shark I could imagine as close as day, it looked like a freight train coming through, the size of it was unparalleled to any animal I have ever seen before. It measured approximately fourteen metres and everyone in the group swam with it for what felt like a long time but was probably only minutes before it ventured off down to thirty metres and beyond. Everyone was on cloud nine after that and I think one of the divers came close to tears of joy after seeing it. It was definitely the highlight of Darwin and of one of many of the trip. We also got to encounter playful Sealions which was incredible. They are such show offs and so incredibly talented underwater. We had so much fun doing barrel rolls and turning trying to keep up with them. They would occasionally just stop right in front of you and look at you as if to giggle at you, then start their acrobatics again. Fernandina was another island we dived around. Here is where having our drysuits really paid off, as the water temperature plummeted to a bloody cold fourteen degrees! At Wolf island the temperature averaged twenty two degrees and at Darwin twenty five degrees so this would sort out the boys from the men. Some divers had 7mm on top of 7mm wetsuits and were still cold on this dive! It was a beautiful dive site though, the landscape itself was amazing, rocky terrain littered with beautiful bright red and green seaweed. 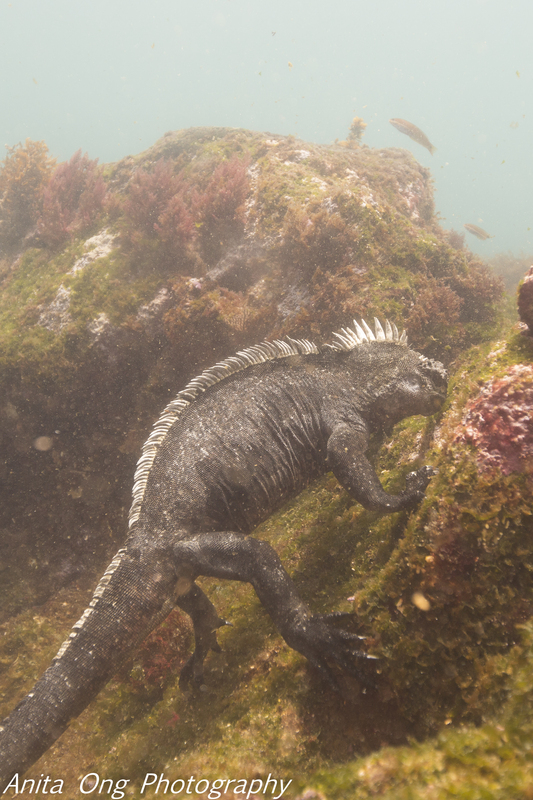 We saw Flightless Cormorant birds diving and hunting underwater, and the highlight of the site was of course seeing the Marine Iguanas diving, swimming and feeding. They really are incredible and after the trip they were most of the diver’s main highlight because you can’t see them anywhere else in the world. We saw a few Port Douglas sharks and the Red lipped Batfish which is a very strange looking creature! The boys seem to be fascinated with it because it was a rare creature known to have never evolved. Personally I was quite bored by it, it didn’t do much but sit there. We geared up for the cold Isabella island dives reaching fifteen degrees. Here it was all about seeing the Mola Mola known as the Sunfish who like the deep water but come up shallow to get cleaned. On the first dive there were eight Mola Mola spotted, unfortunately due to a diver that kicked me rather hard in the face I had what seemed like a mild concussion for most of the dive and only saw four in the distance, along with some stars! Luckily the next dive the guide personally grabbed me and swam with me to get close footage of one, and we saw another three. After that we ended up in a rather strange shallow bay where there were literally hundreds of Green turtles resting, it was very bizarre but it was like New York for Green Turtles down there. They were all males from what I could see. There were also Sealions again chasing them for fun and playing with us. 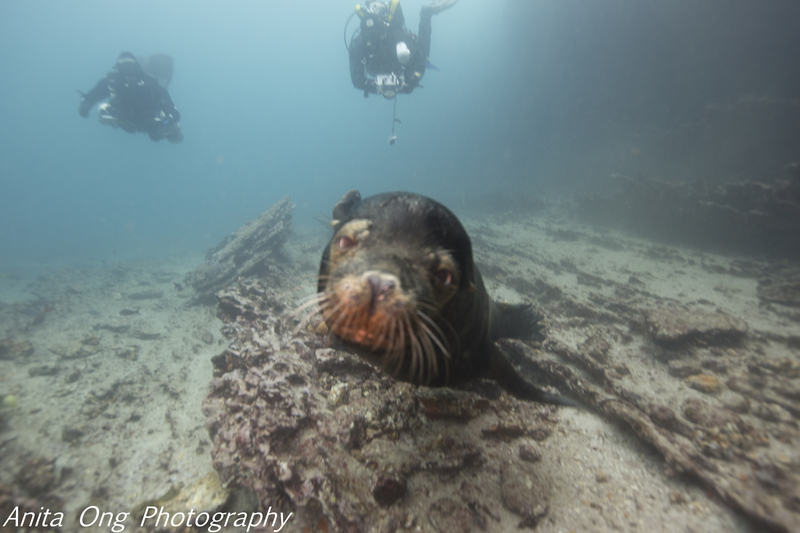 Our last dive site was Cousins Rock and it was a nice way to say goodbye to the Galapagos; a large Sealion mother and her pups playing with us for the majority of the dive. She came right up to us and just sat in front of us looking at us, checking us out to make sure we were harmless and giving her pups the go ahead to play. I knew I would really miss them. 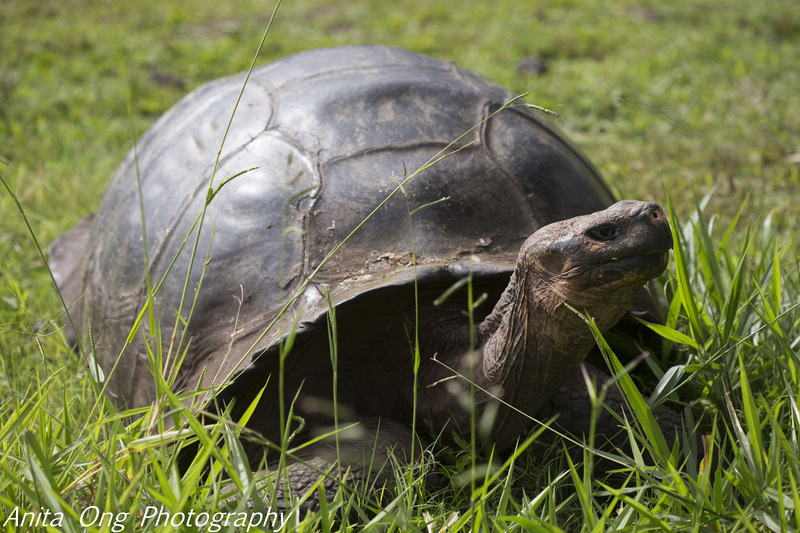 We also got to do some land tours as part of our liveaboard experience, and see the gorgeous Giant tortoises, the Charles Darwin station and the amazing lava tubes that had been carved out by running lava through the islands. Watching an animal that exceeds one hundred and fifty years in age is crazy, trying to imagine what things they must have witnessed in their lives. 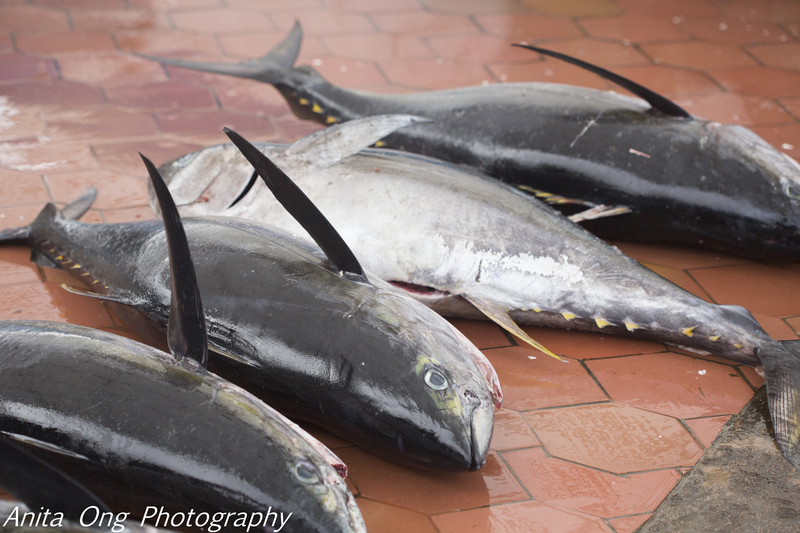 We were lucky to see quite a few moving and feeding as they can refrain from eating for months and not move at all. The service on the liveaboard was top notch and we all want to go again. For the most part the water is not that cold and a 7mm with vest and hood will suffice, but drysuits if you have them are the way to go. There is current, three to four knots on average and we were told it can get stronger than that, but there are plenty of posies amongst the rock to shelter in and you are never swimming against the current you are always drifting. I dived Sidemount and wore my tanks from the liveaboard down into the tender, there was enough room and It was not a problem. I did a negative entry with my camera in hand, this was also no problem for me, nor for the other divers with cameras. For the most part diving in currents was fun, especially when we let go of the rocks and zoomed through three hundred Hammerheads. That was epic! I did lose about 5kg on the trip which I’m not complaining about. Mostly this was because of the equipment I was lugging around on land and in the water, the exertion of filming with one hand on many instances and holding a rock in a current with the other was a great workout. Galapagos does not disappoint at all, in fact even with the highest of expectations you will be blown away by the life there. Everywhere you look there is always something going on, whether its hundreds of Blue Footed Boobies dive bombing fish out at sea, or Silky sharks behind the boat at night, or a Fin Whale passing on by as you eat your breakfast…Galapagos is a place I’ll always have close to my heart and one I will definitely be returning to.